. . She tasted the porridge from the first bowl. "It's too hot!" she exclaimed. Then she tasted the last bowl of porridge. "Ahhh, this porridge is just right," she proclaimed, and ate it all up. Sunday was cool, but not too cold; a nice wind, but not too light; sunny, but with a little bit of cloud; traffic on the water; but not as much as last time. A very healthy starting fleet of 10 boats converged around Clark Island and spent some time ogling the beam-y beauty of our newest entrant, Enterprise. 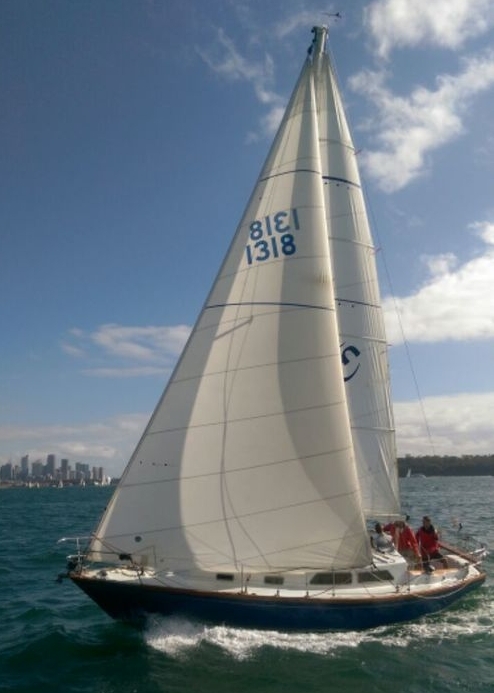 With one exception, we all left in correct starting order on Course 3 and enjoyed a 10 knot Easterly up to Manly. It was quite a sight to look back at 4 boats vying for position in the short stretch between Manly West and East. Separation between the boats was slower developing on the work back to Shark Island as the wind turned slightly to the South. The only chance to put up a spinnaker was in the short run to the finish line after Shark Island. Megisti and Megisti Blue seemed unsure whether to hoist and hesitated. Both paid the price and were overtaken at the finish line by G-Whizz and Crooz, respectively. So close! What wasn't close was Celete's winning margin. After her half-sinking, she has obviously be re-born anew. It's a miracle! Or was it Glen's helming? Just ask him . . .
Megisti re-takes 1st place in this series with Megisti Blue still in the hunt in 2nd. 3rd place changes to Martela. Next race is Spring #7 at 13:00 on 25th November. And don't forget our Sue Heyder Christmas Race & Lunch on December 8th.